One of our newest sections at the Viridian Gold website is our Religious Medals Collection. These medallions are popular for commemorating baptism, confirmation, and first communion, so we have many designs with the appropriate symbols for these occasions. Most of the medals can be engraved with names and dates if desired--of course, we can do this for you prior to shipping your order. Our Religious Medallion collection also now includes Saint's Medals. Of course, we have several designs of Jesus Christ and His Mother, cherub and guardian angel designs (shown above), and we will be adding more saints to this section over time. For now, you can find medals of the Archangels Michael and Gabriel, St. Agatha, St. Agnes, St. Benedict, St. Francis and St. Christopher (shown at right). Most of these saint's medals are available in different styles, as well as both yellow and white gold, and sterling silver. 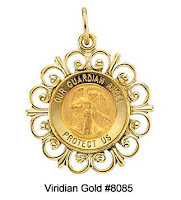 As with all pendants at Viridian Gold, we offer a select group of gold pendant chains that can be purchased at a discount from our normal price when they are paired with a gold pendant. Sterling Silver pendants either come with a silver chain, or you have the option of adding a free silver chain to your order.